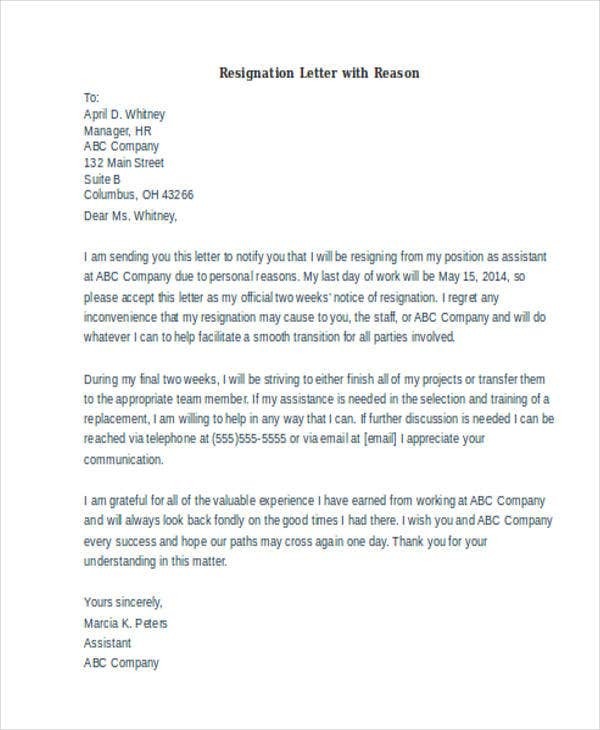 Whatever the reason for your job resignation, it is of utmost importance that you send a timely, articulate, and well-written job resignation letter. 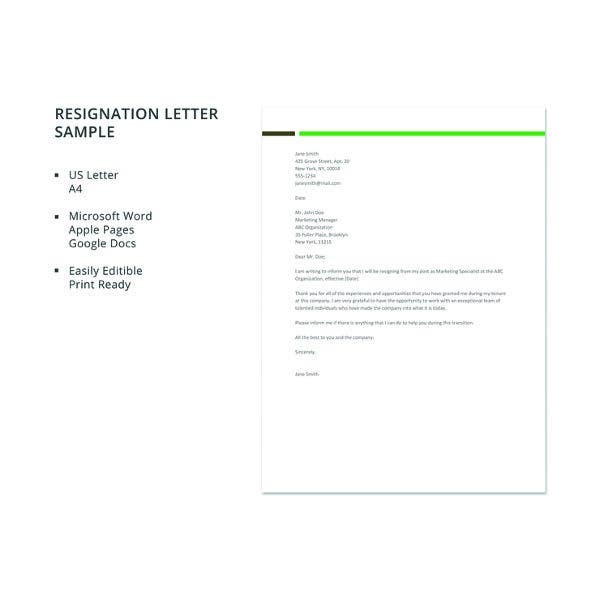 To help guide in your letter writing, download our templates on this page. 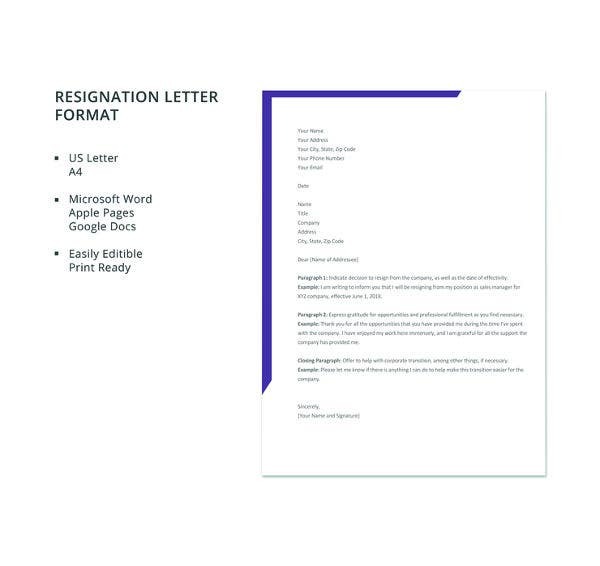 These templates are available in PDF and Word formats, thus making it easier for you to access and store in your devices. 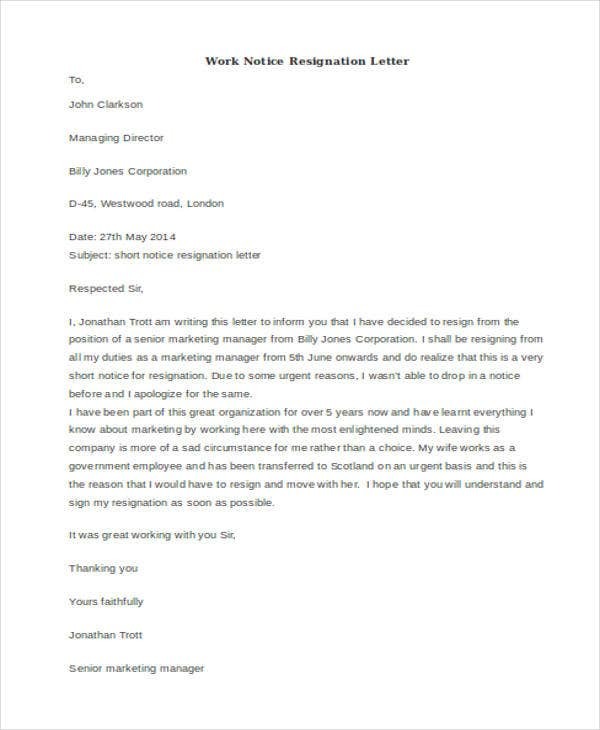 You may also choose to edit any of these should you decide our template sufficient for your specific needs. 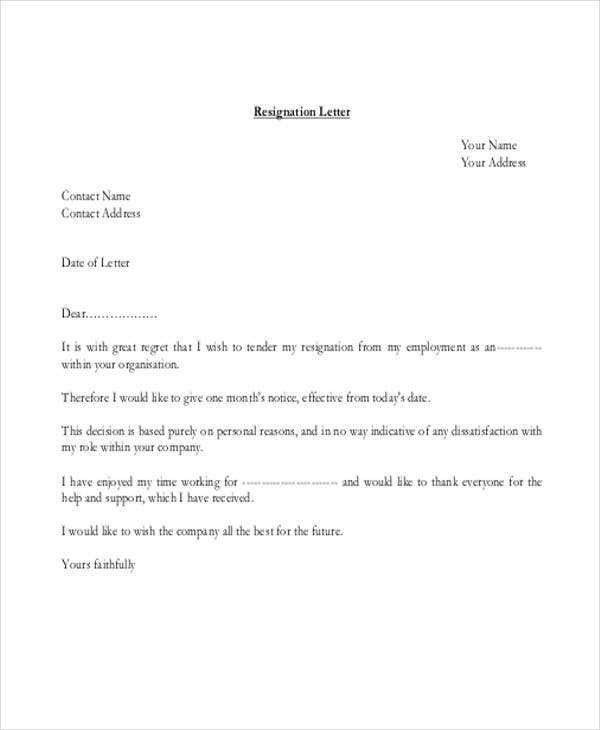 A resignation letter is a formal document written by an employee to his/her employer, supervisor, or manager. 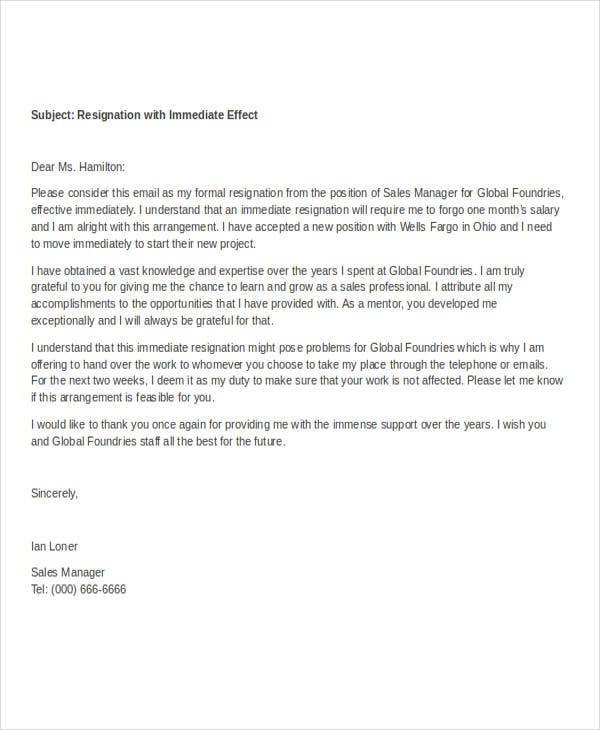 The purpose of this letter is for employees to notify the mentioned individuals regarding his/her intention to leave his/her job in the company. 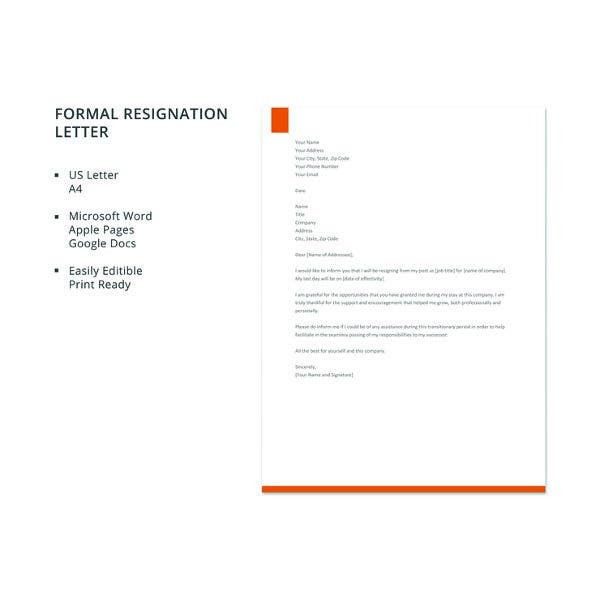 The submission of a resignation letter is an essential part in the resignation process. 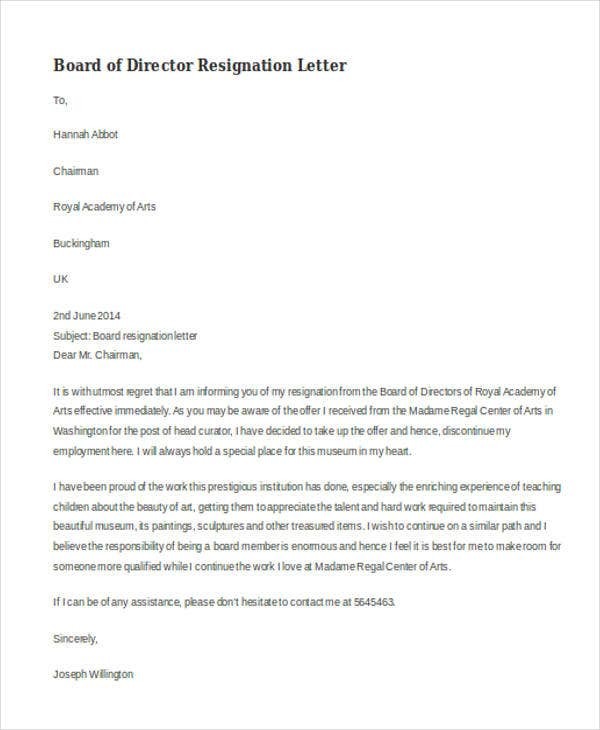 What Are the Different Reasons for Resignation? 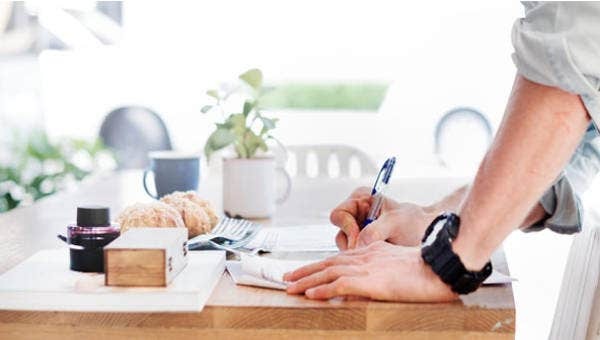 The employee’s financial needs which he/she can best provide for when working for a more lucrative job in a different company or organization. 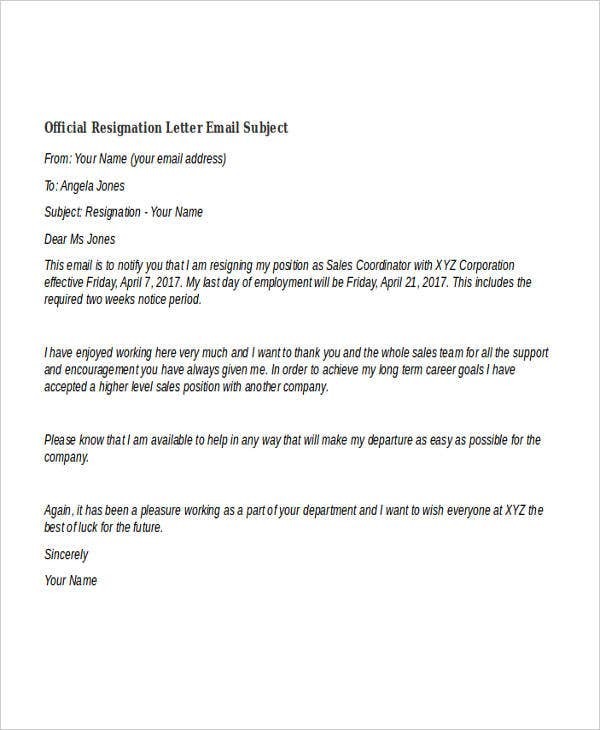 The employee’s career growth which he/she cannot nurture in the company or in the position which he/she is currently holding. 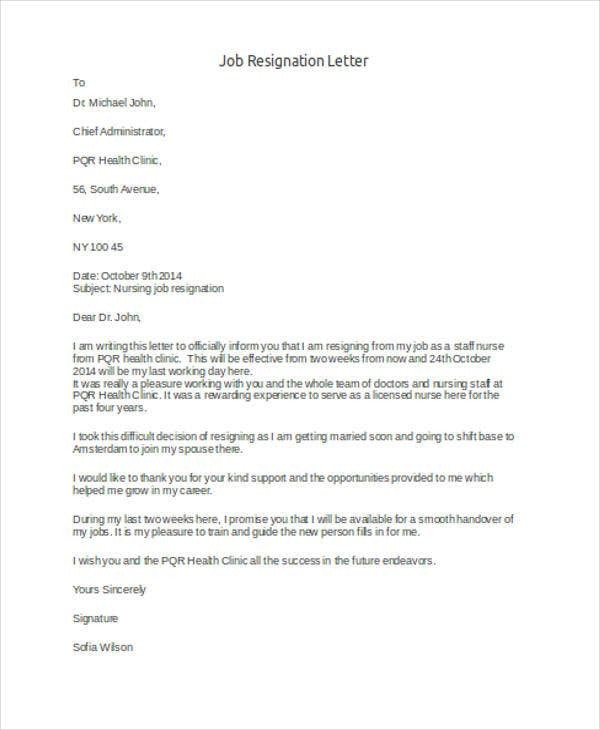 The employee’s physical disability, illness, or grave injury which can incapacitate him/her from fulfilling satisfactorily the job functions which are normally required of him/her. 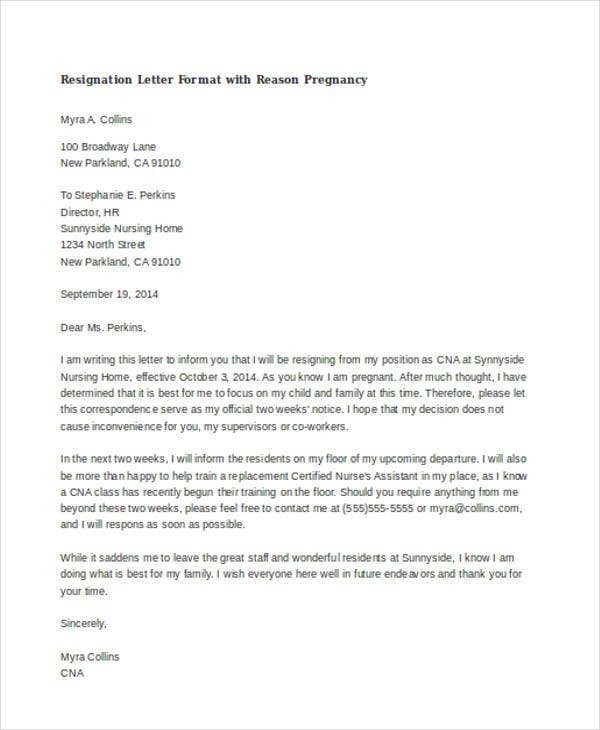 The employee’s personal reason for resignation that is,need to take care of a family member. 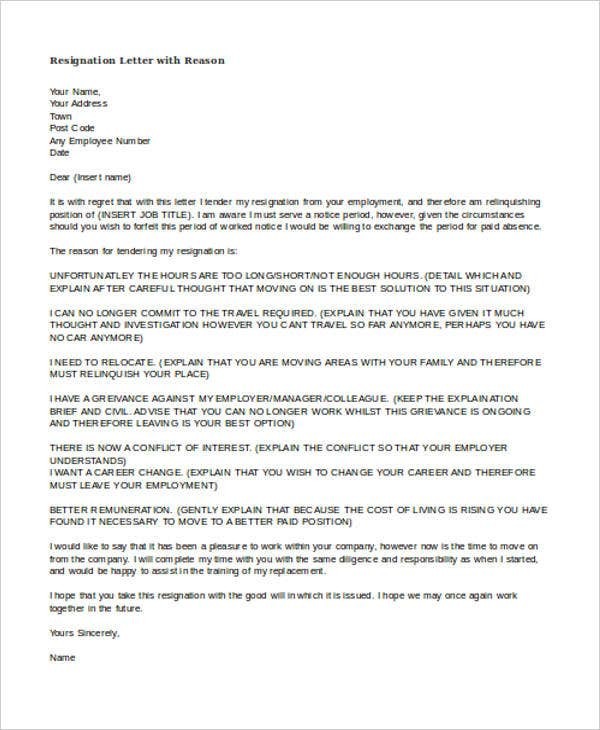 The employee’s need to relocate to a far-off place which would make it impossible for him/her to report to the office. 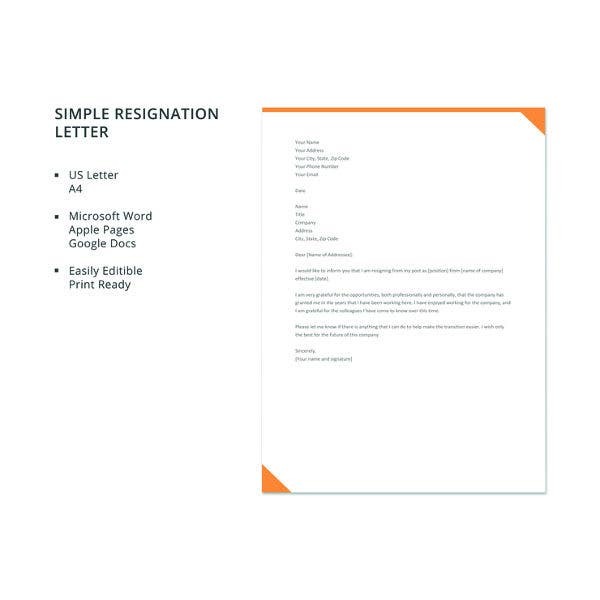 Speaking of resignation letters, refer to our templates on this page for your guidance. 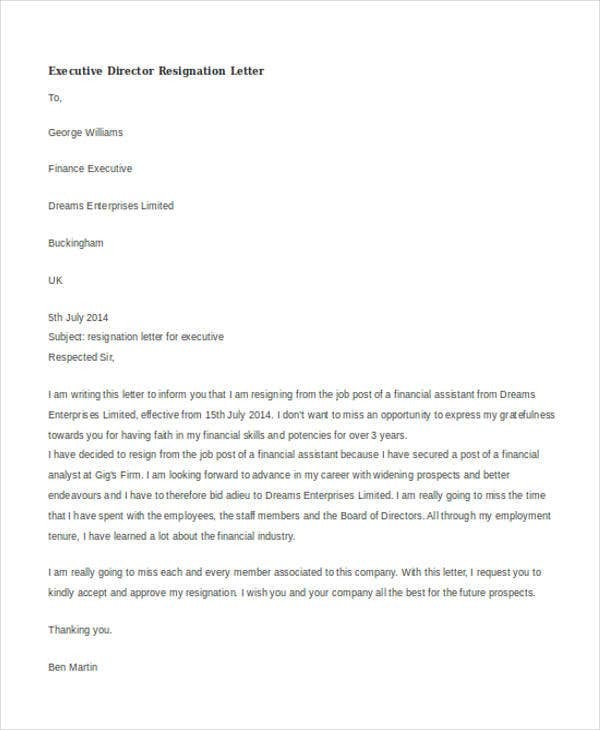 You may also opt to check out our collection of Employee Resignation Letters which can also provide you with the proper format and content of the different types of resignation letters. 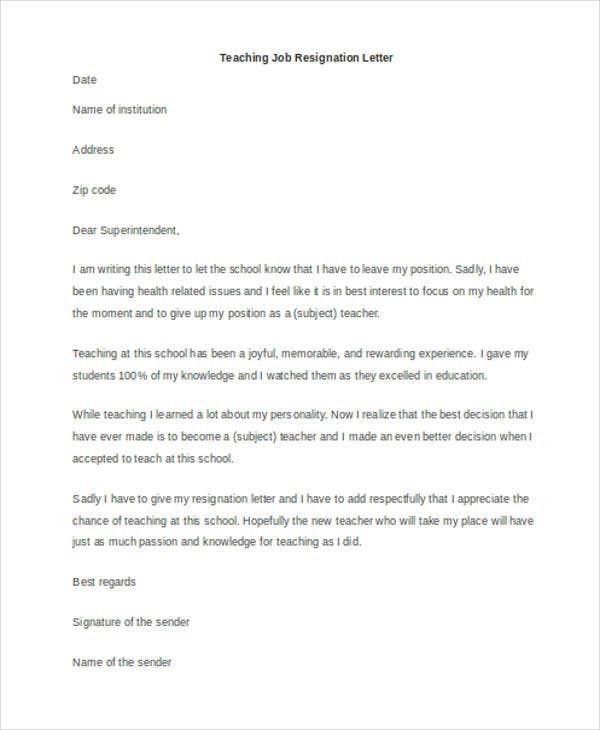 To access these templates, simply visit our website. 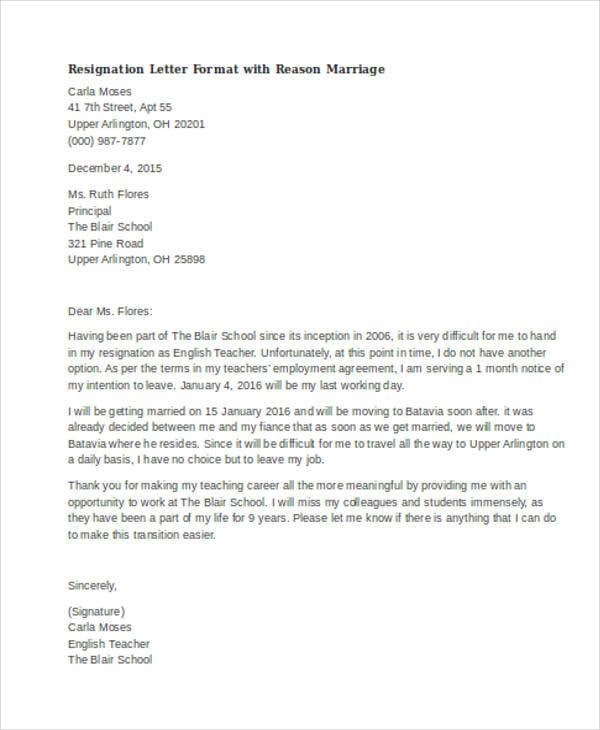 Always observe the proper rules in writing a formal letter template since a letter of resignation letter is a type of formal letter. 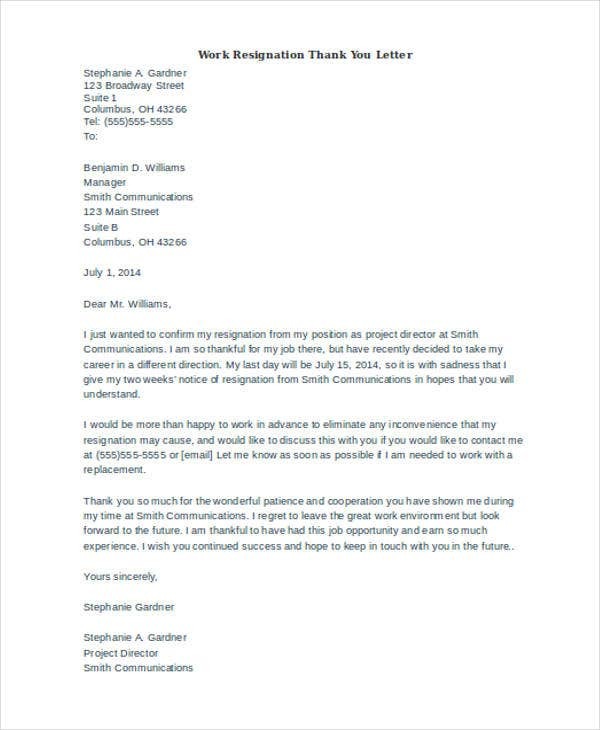 In the formal greeting, address your employer or manager formally. 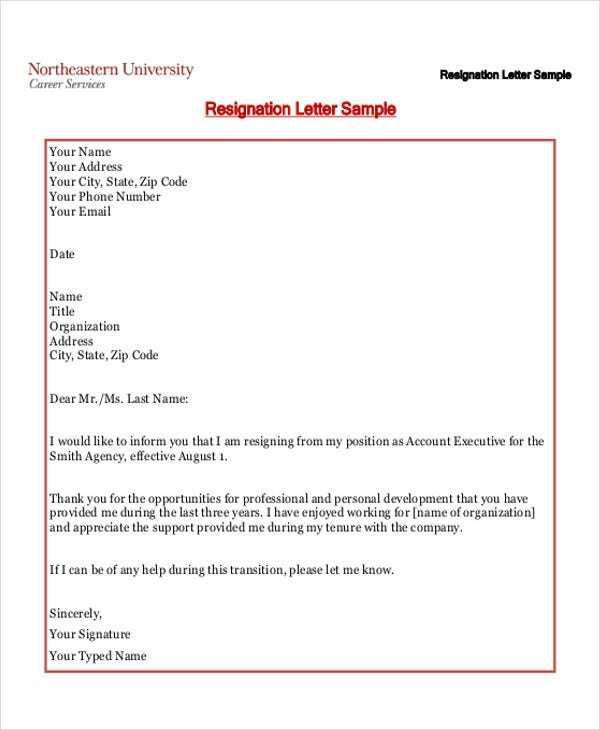 Do not make the assumption that since you are already on a first-name basis with your employer or manager that you can be informal and unprofessional in your resignation letter. 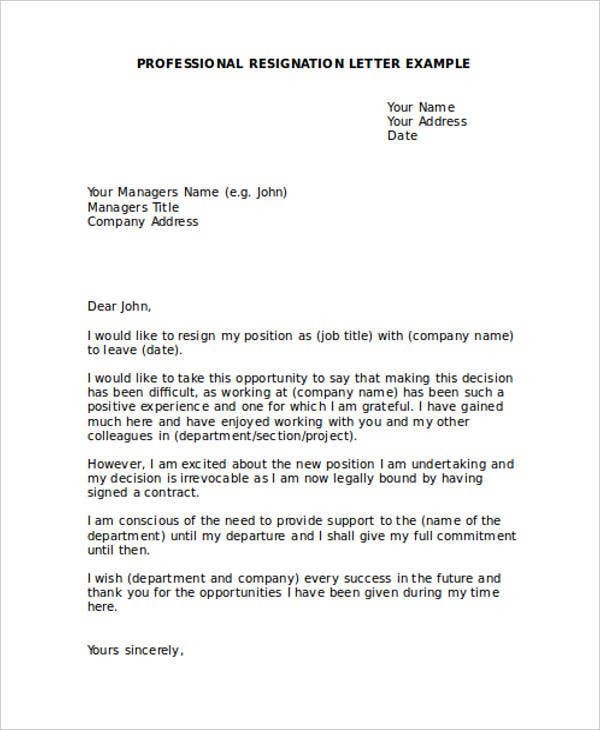 Always remember that you are in the professional setting and the purpose is a professional resignation letter as well. 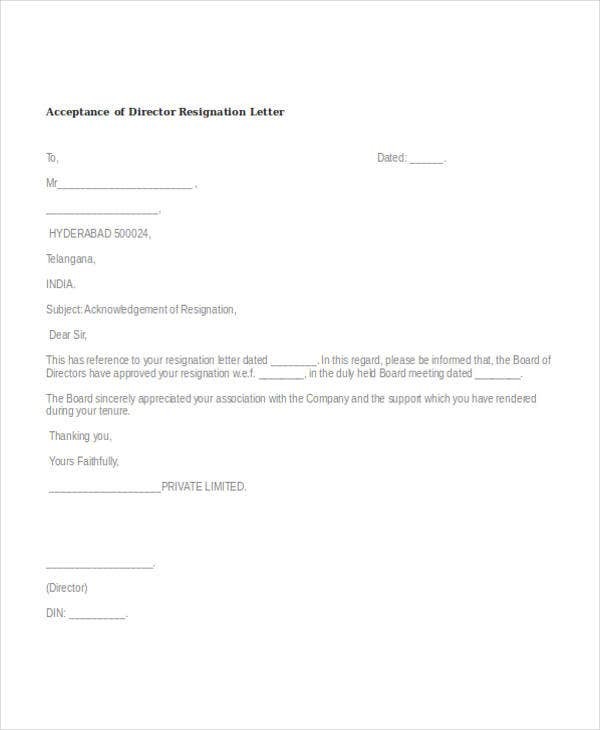 In the body of your letter, state clearly your intent to resign from your job. 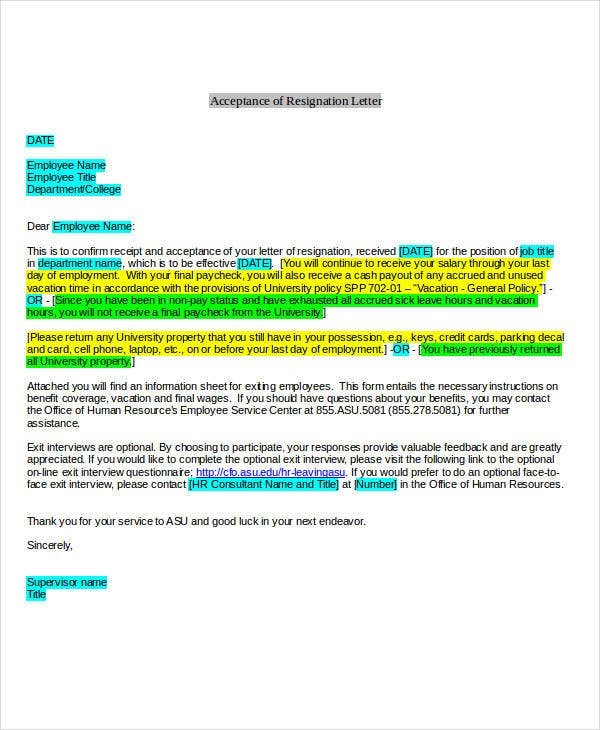 Avoid writing vague and unclear statements. 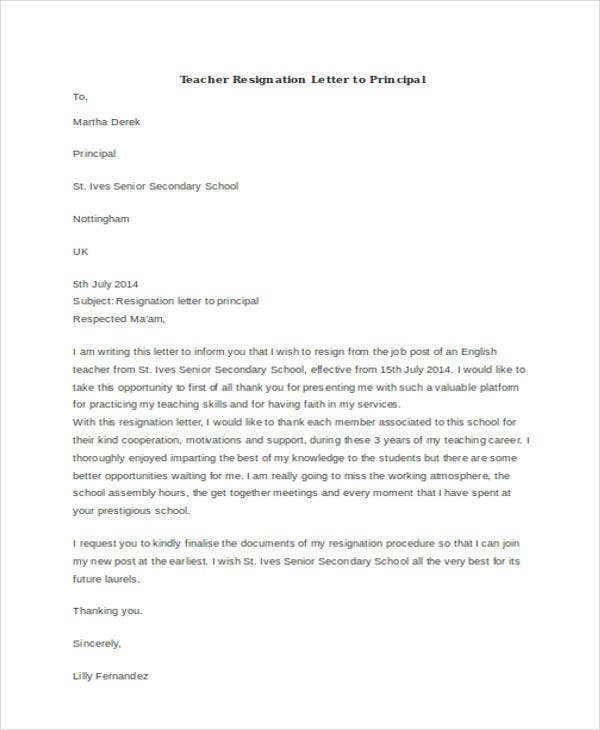 Go straight to the point and explain thoroughly the reason for your decision to resign. 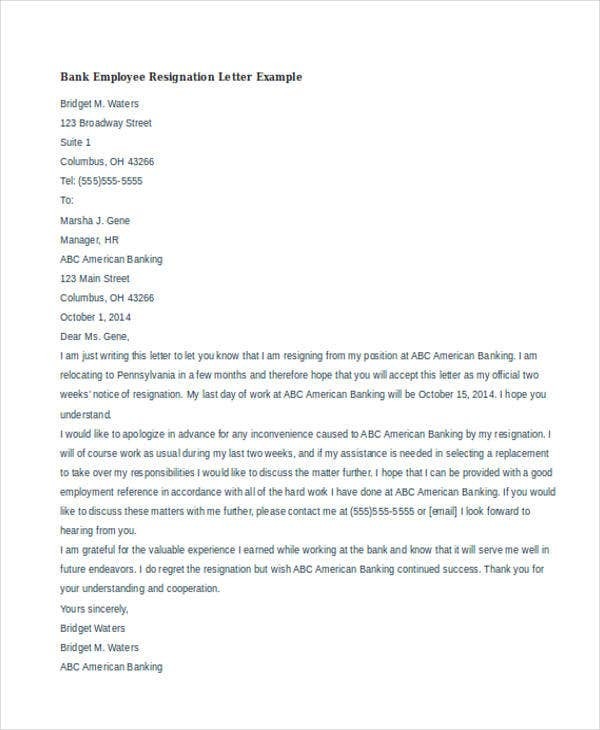 If necessary, you may also attach other documents to certify the veracity of your reason for resignation. 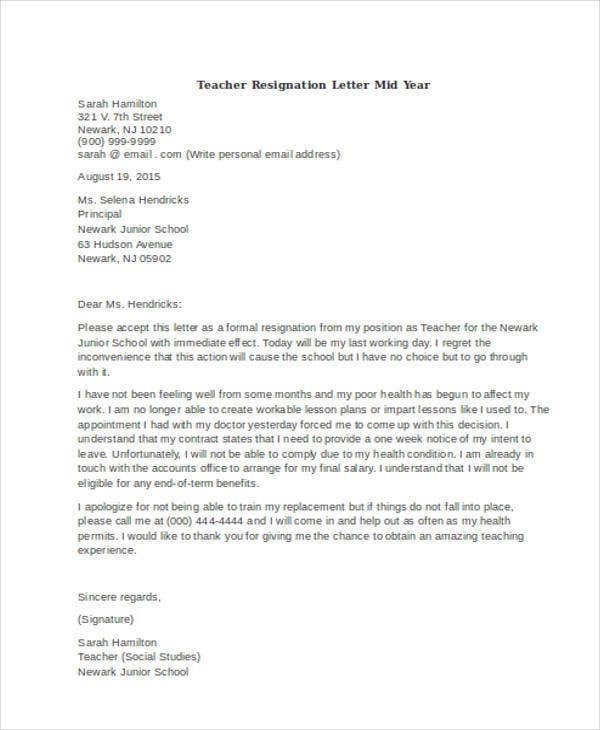 This is only applicable in cases when you are vacating your position due to your health or due to a family member’s illness or more serious matters. 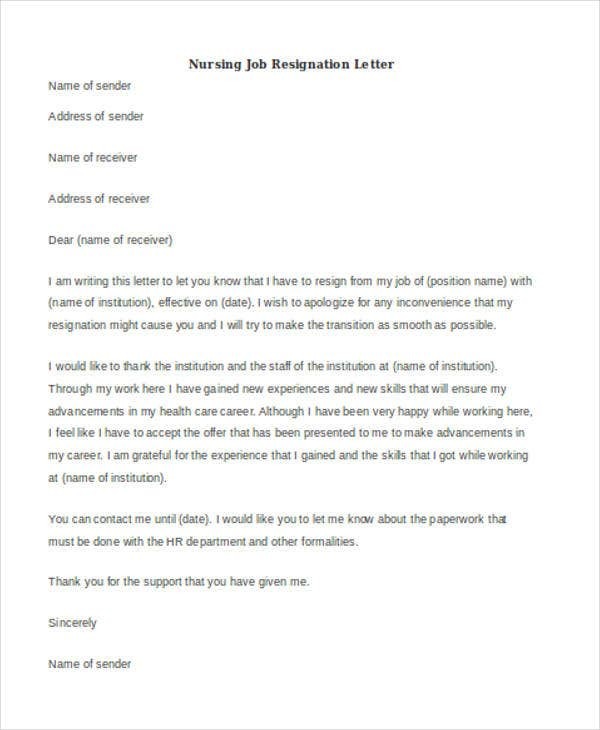 Don’t forget to conclude your letter in such a way that you stamp a positive feeling on your employer’s awareness by expressing your gratefulness toward him/her for the opportunities being provided to you in the company. 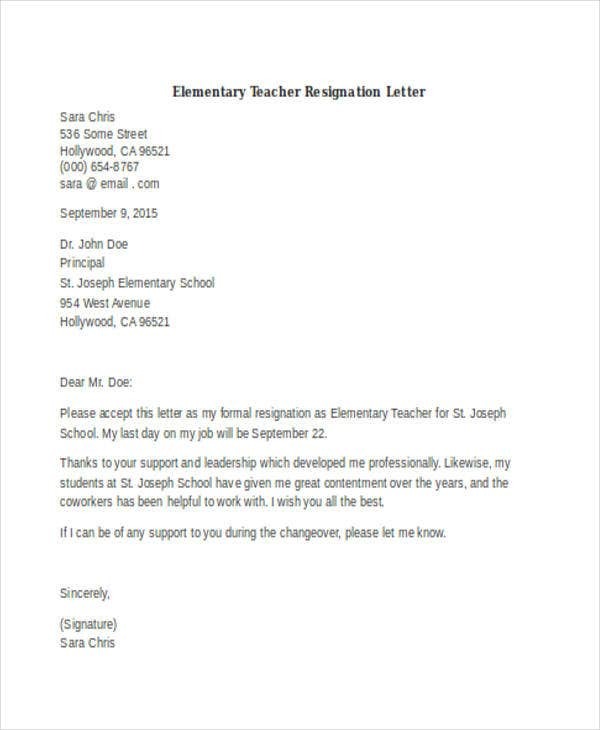 Write a polite closing remark. 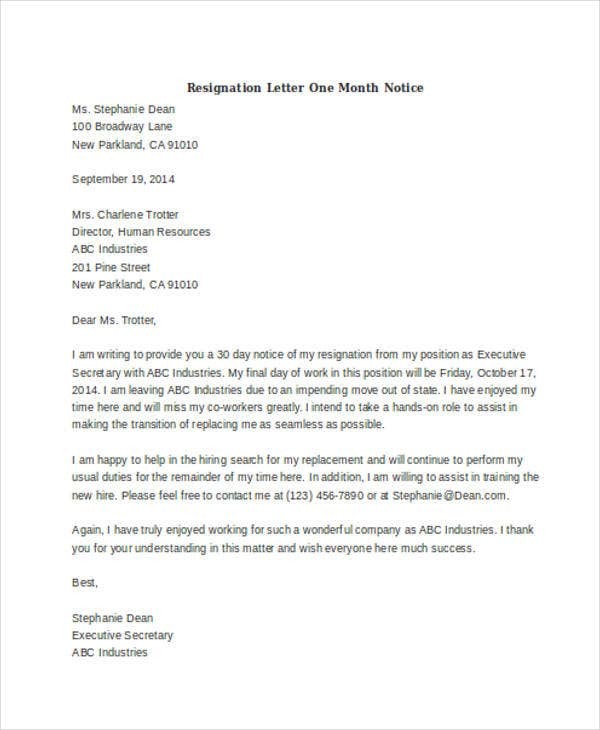 As mentioned, there could be various reasons for an employee’s resignation. 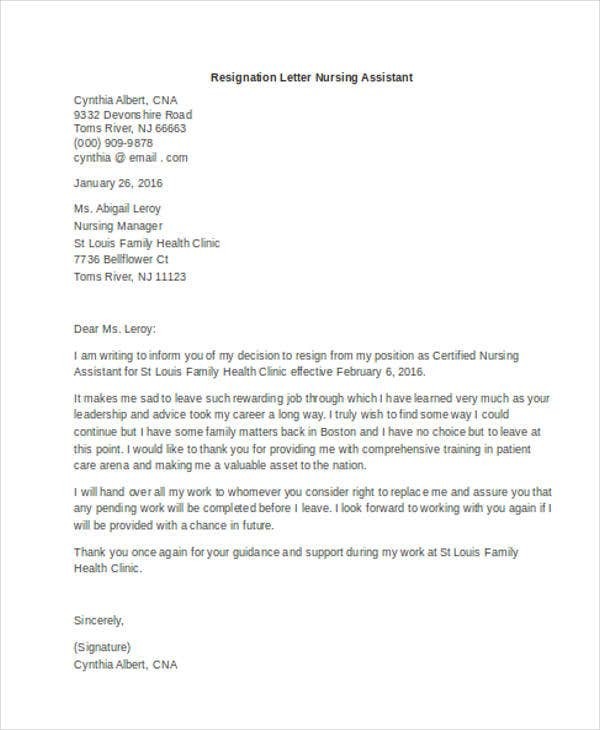 If you are resigning due to your medical illness or due to family reasons, then our collection of Personal Reasons Resignation Letters would best exemplify the proper way of writing such types of resignation letters. 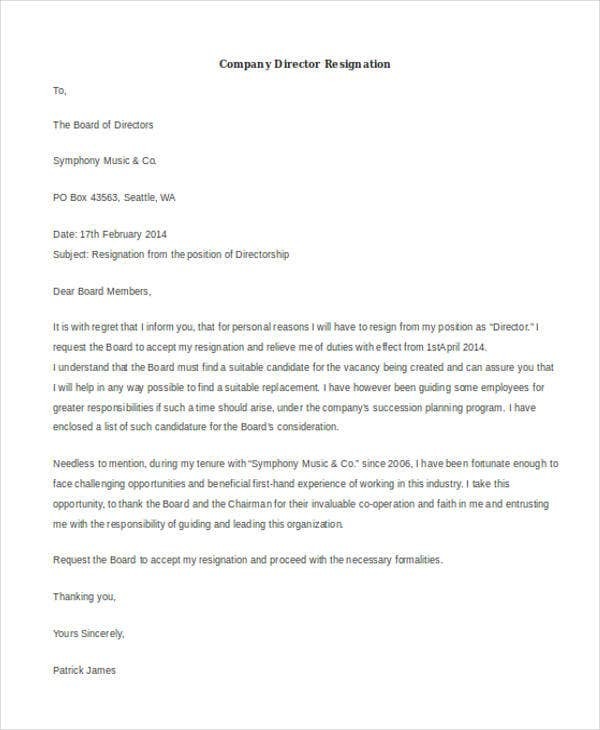 Contractual obligations. 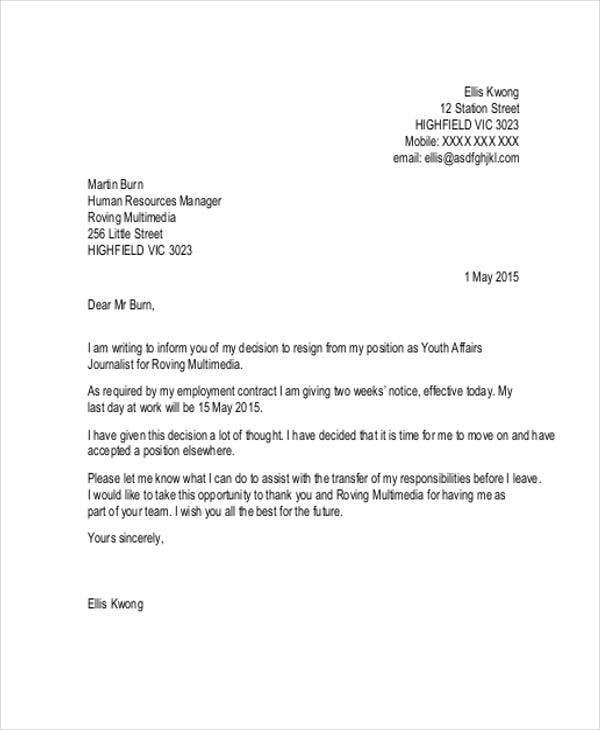 Check the employment contract template which you’ve signed on the day you accepted your job. 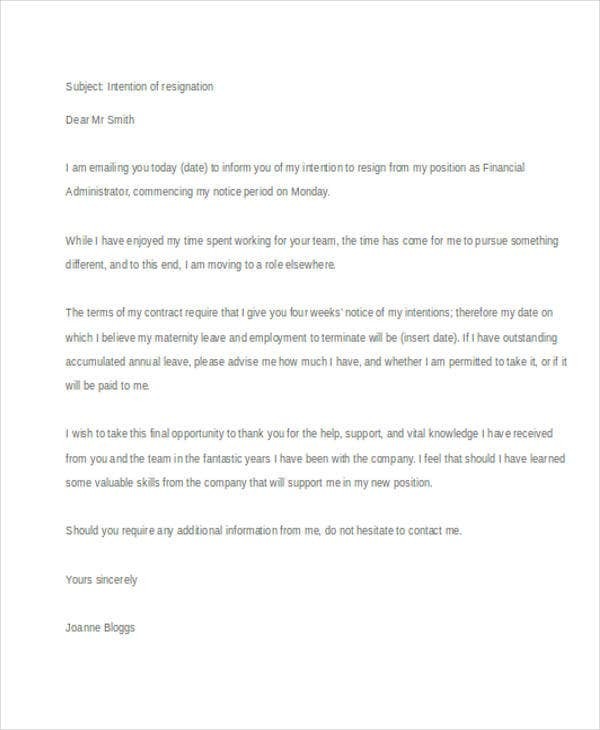 Most companies indicate on the employment contract which reasons for resignation are considered as valid. 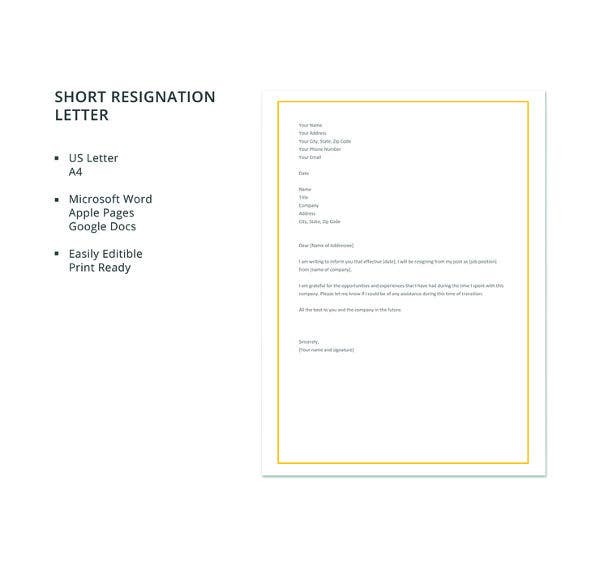 Company policies. 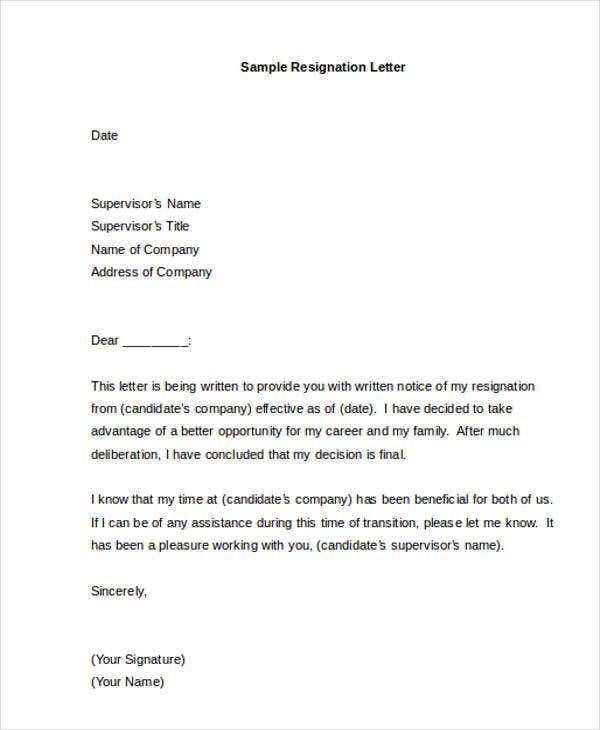 In an employee’s handbook or during the orientation, he/she would be informed of the step by step process of job resignation in the company. Statutory requirements. 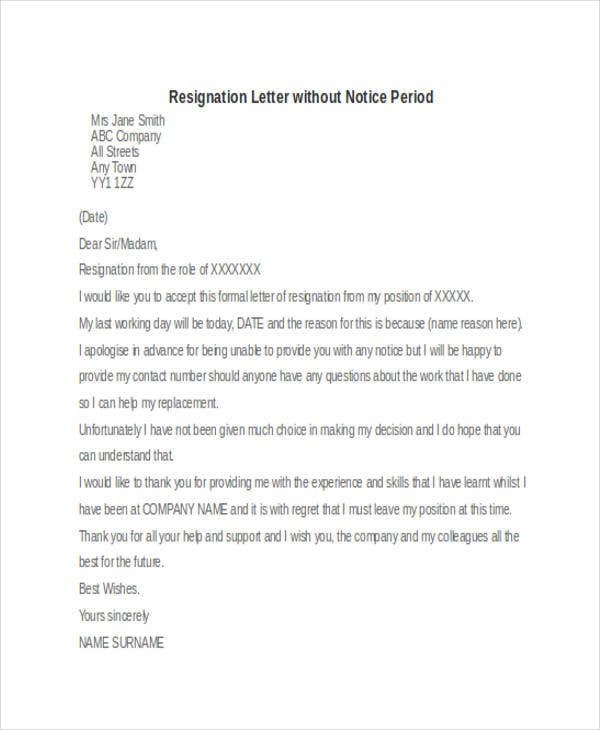 While most employers ensure that their companies are able to standardize all the processes including the resignation processes, some companies (especially the new and budding ones) would fail to impose standard rules on resignation. 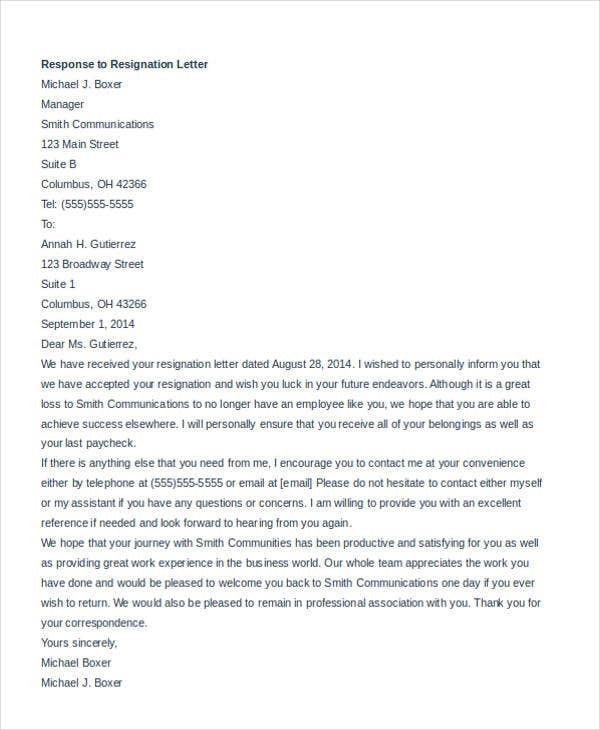 When this happens, you need to check the pertinent laws of your state regarding the legal way of job resignation. 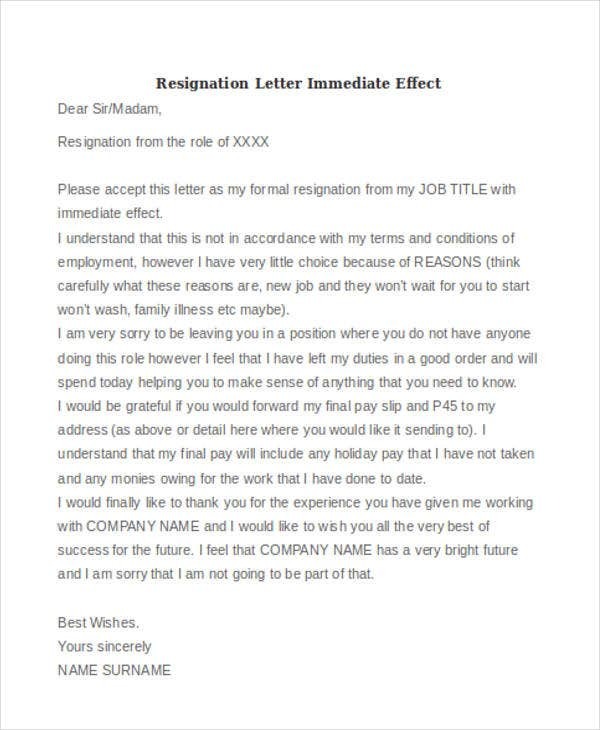 If you share a more casual relationship with your employers, check out these Funny Resignation Letters you could use instead. 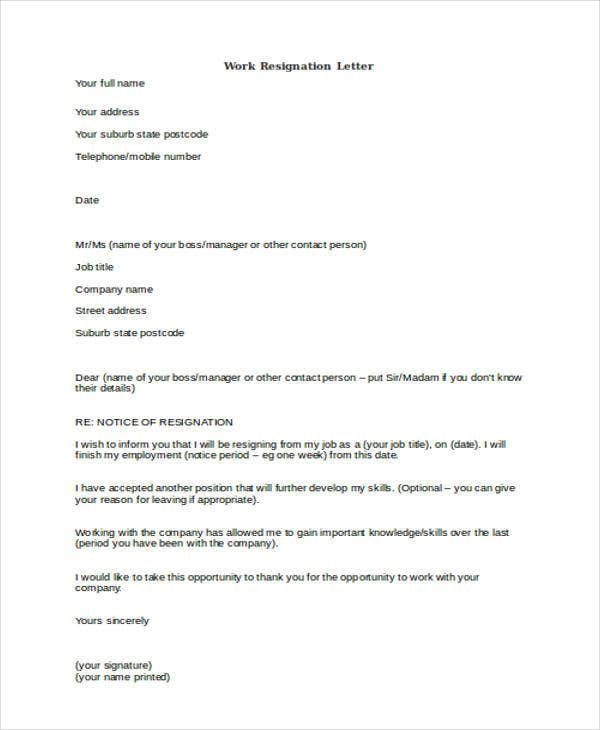 Why Is It Important to Observe Notice Periods? 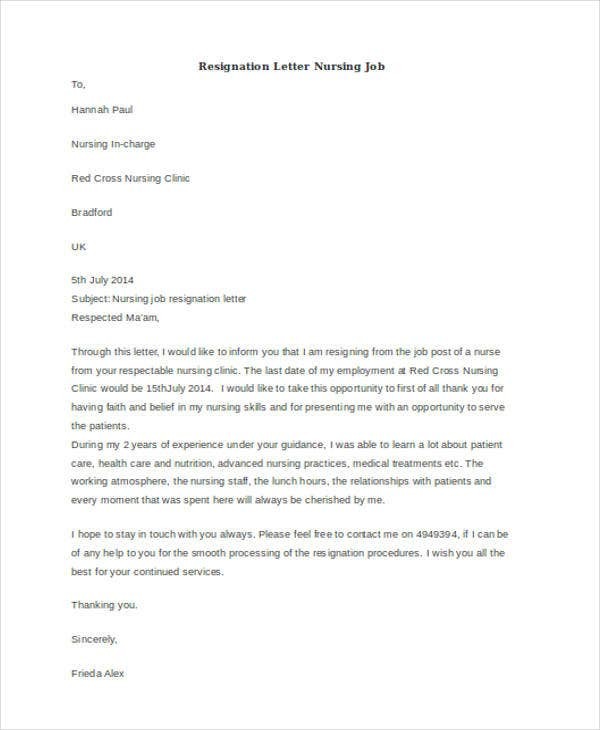 If you want more samples which can enlighten you as to the specifics of writing a resignation letter, we have Simple Resignation Letters ready for your download.